We recently sat down with TV chef Gino D’Acampo to talk about his passion for all things Italy (see Sept 17th issue of the magazine). This coming Friday, Sept 13th, begins his new series for ITV ‘Gino’s Italian Escape‘. He’ll be traveling all over Southern Italy and sharing some of his favourite recipes along the way. There is a book to accompany the TV series published by Hodder & Stoughton which is packed with over 100 deliciously simple recipes. Gino very kindly gave us permission to publish two of his recipes here… We can confirm, having attempted both of them ourselves, that they taste as good as they look! Gino’s Italian Escape, published in hardback and eBook on 14th September 2013, priced £13 from Amazon.co.uk. To make the béchamel sauce, melt the butter in a large saucepan over a low heat. Add the flour, whisking constantly, until you get a thick, creamy texture with a light brown colour. Pour in a third of the milk and continue whisking. When the mixture starts to thicken, pour in another third of the milk and continue whisking. Once thickened again, pour in the rest of the milk and the Parmesan. Whisk until the sauce has a custard-like consistency. Remove from the heat and mix in the prepared pesto. 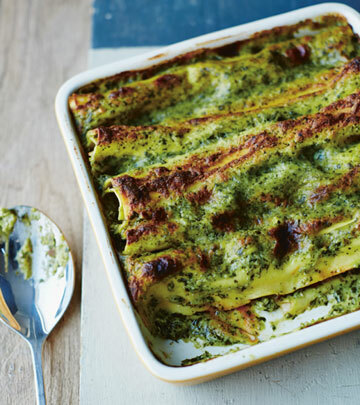 If you are preparing the cannelloni the day before you plan to eat it, cover with cling film and refrigerate. Take out of the fridge 20 minutes before cooking, and bake in a preheated oven at 180oC/gas mark 4 for 45 minutes.